After 25+ years and many incarnations, the Soulard Blues Band - arguably the hardest working band in town - still tears up the town one show at a time. It is not every band you run across that has a mission beyond just steady giggin', but then again, as one of the longest-lasting acts around - and with nine straight wins in the "Best Blues Band" category in a popular local poll - the Soulard Blues Band is not just any band. As bassist and sole remaining founder Art Dwyer will tell you, "Our mission always is just to leave things around a little better than we found 'em." That ethic applies equally to song arrangements, the mood of the audience and the entire musical scene in this city that birthed such towering talents as Miles Davis, Johnny Johnson, Henry Townsend, Oliver Sain and many more. And from all appearances, the mojo is working: the blues landscape in St. Louis now is "better than it's ever been since we started out, playing in the intersection of Menard and Geyer with absolutely no cars or people coming by to cause us to have to move," Dwyer says. He formed the Soulard Blues Band in 1978, "just a long-haired guy in blue jeans and sandals," motivated in part by memories of the St. Louis of his childhood, when clubs with names like Shalimar and Oasis and the Peppermint Lounge and Sadie's Personality Bar jumped with live music and people "dressed up looking flashy" any night of the week, and fifty cents' cover got you in to Ike and Tina Turner's set at the Club Imperial. This town has always been alive with world-class players in neighborhoods all over the city," Dwyer says.The band creates music from both originals and standards that manages to let each player shine without sacrificing the song to overblown solos. Indeed, that's one of the goals in group's frequent rehearsals, says Dwyer: "We are in the business of supporting each other in playing, to play in unison with each other." 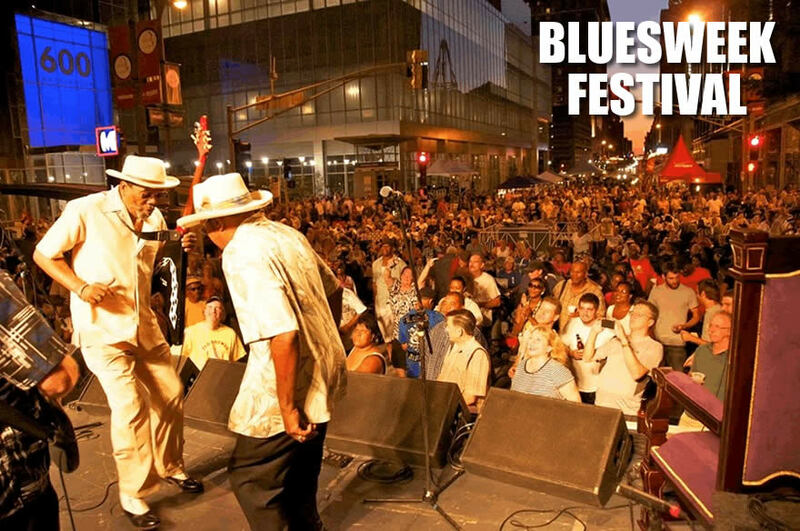 And in so doing, blending seamlessly into the fabric of a city with a deep history in the blues." "Thank you for taking the time to send me the newspaper article on the Soulard Blues Band. I hope you enjoyed their music as much as we do here in St.Louis. Thank you very much for inviting St. Louis musicians to perform at your festival." The cigarette smoke hangs heavy in the air, like Los Angeles smog, and the alcohol has people loose and easy. It's not a night for being on the wagon, it's a night for shouting, screaming, singing and brawling. The girls hit the dance floor, shaking and spinning, and the boys from the Soulard Blues Band just keep on playing. There's not a foot that isn't tapping in the place. Knees are slapped, tables are rapped and cigars are waved to the beat of Art Dwyer's big old bass. -----A weary waitress in slinky black carries trays of drinks by the dozen, nodding at the women, showing cleavage to the drunken men, bidding for tips and money for her cab ride home. The owner of the Grizzly Bear bar sits at a back table, tipping his cap to friends and strangers. He's seen it all before, but it's never just another night. Puffing on endless cigarettes and drinking his usual, he watches with pride and keeps his eye on the till. -----A big, old, tabby cat hogs the entrance, ignoring those who pass by and nonchalantly checking out those that come inside. The bar is his, and he knows it. This is the blues, baby, and it doesn't get any more real than this. - ----You can't escape them in St. Louis. The blues drift on the smelly waters of the great Mississippi, hum in the streets downtown and light up bars all over the city. -----The squeak from a trumpet, the deep twang from a bass, and the wop-wop-wop of a drum kit ooze out from St. Louis' nooks and crannies. Wrinkled black guys are treated like pop stars. Fat white guys carrying trumpet cases are stopped in the street. -----Music is the city's soul, its lifeblood. The blues is sad, but it's just so good you can't help but feel uplifted. You almost want to have your heart broken so you can feel the groove. And it's not all that's a-rockin'. But you'll always come back to the blues: on stereos, while sipping coffee in cafes; from run-down flats, as musicians tune up and from beat-up taxis darting around busy inner city streets; in hidden-away bars in hidden-away corners; in dark clubs filled with sweat, smoke, love and hormones; and in restaurants and cafes that live long after sundown. Kerry Williamson visited the United States as winner of the 2000 Bell Journalism Award for young Otago and Southland journalists. He traveled to St. Louis with the help of Air New Zealand, which flies to St. Louis through its Star Alliance, and was looked after by the St. Louis Convention and Visitor's Commission.